The 1983 Borah Peak earthquake occurred on Friday, October 28, at 8:06:09 a.m. MDT in the western United States, in the Lost River Range at Borah Peak in Central Idaho. The shock measured 6.9 on the moment magnitude scale and had a maximum Mercalli intensity of IX (Violent). It was the most violent earthquake in the lower 48 states in over 24 years, since the 1959 Hebgen Lake earthquake in nearby southwestern Montana. The earthquake was caused by a slip on the preexisting Lost River Fault. The event is the largest and most significant to strike in the state of Idaho. Two children were killed by falling masonry while walking to school in Challis, about 120 miles (190 km) northeast of Boise, the state capital. Twelve and a half million dollars in damage took place in the Challis-Mackay region in Custer County. As a result of extreme surface faulting, a maximum Mercalli intensity of IX (Violent) was decided upon, while vibrational damage was at a Mercalli intensity of VI (Strong) to VII (Very strong). Three weeks later on November 18, President Ronald Reagan declared the earthquake a major disaster. Aftershocks were felt for a year afterwards; nearly ten months later, a 5.4 aftershock was recorded on August 22, 1984. 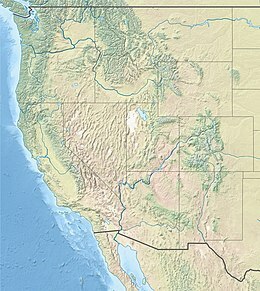 The rupture caused clear surface faulting; a 21-mile (34 km) long northwest-trending zone of fresh scarps and ground ruptures was present on a slope of the Lost River Range. Extensive breakage occurred along a five-mile (8 km) zone between West Spring and Cedar Creek; ground surface was literally "shattered" into tilted blocks, each several meters in width. These scarps were as broad as 330 feet (100 m). The ground breakage was 100 km wide. The throw on the faulting ranged from -50 cm to 2.7 m.
The Challis-Mackay region experienced rather thorough damage, with eleven commercial buildings and 39 homes sustaining major damage while another 200 houses suffered minor to moderate damage. Mackay in particular, about fifty miles (80 km) southeast of Challis, experienced the most severe damage. Most of the city's large buildings on its Main Street were damaged, to some extent; eight of these buildings were deemed condemned and closed down. Most of these buildings were built from materials such as brick, concrete block, and stone, each varying. An estimated $12.5 million in property damage was recorded. In some places, the water grounds shifted. Near Chilly Buttes of Thousand Springs Valley, a series of artesian fountains/sand blows erupted immediately after the main shock. Groundwater gushed from these fountains forming small craters and depositing aprons of light-colored sandy sediment around each crater. ^ a b Yeats, R. S.; Sieh, K. E.; Allen, C. R. (1997). The Geology of Earthquakes. Oxford University Press. p. 476. ISBN 978-0-19-507827-5. ^ a b "Idaho quake measures 6.9, two killed". Spokane Chronicle. (Washington). wire reports. October 28, 1983. p. 1. ^ a b Sher, Jeff (October 29, 1983). "Killer quake rocks Northwest". Spokesman-Review. (Spokane, Washington). p. 1. ^ a b "Quake jolts 8 states, kills 2 children". Eugene Register-Guard. (Oregon). (Los Angeles Times). October 29, 1983. p. 1A. ^ AP. "TWO CHILDREN DIE AS QUAKE HITS NORTHWEST AND CANADA". Retrieved 2018-11-12. ^ "Observatory Seismology". publishing.cdlib.org. Retrieved 2018-11-12. ^ "Quake disaster area declared in Idaho". Lewiston Morning Tribune. (Idaho). Associated Press. November 19, 1983. p. 3C. ^ a b c "Idaho Earthquake History". 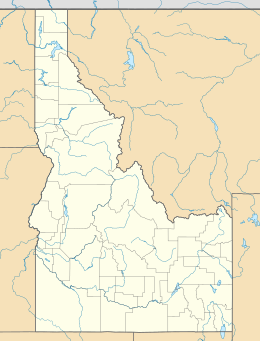 ioem.idaho.gov. Retrieved 2018-11-12. ^ "4.5 aftershock quietly shakes Challis-Mackay". Deseret News. (Salt Lake City, Utah). January 25, 1984. p. 16B. ^ "Idaho quake jolts, but not like 1983's". Deseret News. (Salt Lake City, Utah). UPI. August 23, 1984. p. B19. ^ "Earthquake jolts Idaho". Spokesman-Review. (Spokane, Washington). wire services. August 23, 1984. p. 27. ^ "Historical Earthquakes in Idaho | Idaho Geological Survey". www.idahogeology.org. Retrieved 2018-11-12.